O'Bradovich was one of those rare athletes that grew up in, went to college in, and enjoyed a long career in the same state. 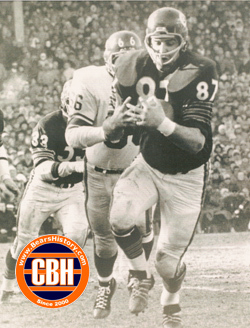 "OB" as he was known throughout his career grew up in Hillside, IL, attended the University of Illinois, and played his entire career for the Bears. Perhaps the singular memory of O'Bradovich was when he intercepted a short pass in the 1963 NFL Championship game and rumbled down the field on a key play to help the Bears to victory. Following his retirement, O'Bradovich has closely followed the Bears, giving both Dan Hampton and Mike Ditka's induction speech to the NFL Hall of Fame.